For people who still do not know, I’ve been using the Olympus OM-D E-M10 for about 6 months now and it's been the camera that I bring around to food tastings or when I hang out with my friends on a casual day out. Not only does it look vintage, it is also compact – especially with the 25mm F1.8 Prime Lens. Of course, what is taking amazing shots without sharing them? The in-built Wi-Fi function allows me to transfer good quality images on-the-go and into my phone within seconds! Though snapping away on the phone is convenient, it can never beat the quality on an actual unit. So what does it take to get a good, Instagram-worthy shot, you might ask. Some say good lighting, some might argue that you need a pretty table, plates and maybe a prop or two. And of course, some say that most importantly the food needs to be photogenic - like we all know, brunch food. I wouldn't deny that all those aspects are equally importantly, but if i could shamelessly say this - i think it's pretty important that you have a good camera to get a great shot (at least to me). I usually have problems with bad lighting (that is extremely yellow) at restaurants, or if i am dining in the night, but most of the time it can be fixed by hitting a few buttons and and adjusting the WB. Here are a few tips though, which may get you the shot you have always wanted to achieve. There will always be a time where there's too much food on the table and you just to want capture everything. The best way to capture this is to get up there and shoot from the top. My tip for you is to make sure that you stand at an angle that does not capture any shadow. Also, try not to arrange your food too neatly, and perhaps add in a fork or two, a friend's hand perhaps, or even a small flower or prop you might find nearby. Most of the time you see me shamelessly standing on a chair to get a shot like that, but trust me it is pretty worth the effort. Another tip is be careful of shaky hands when you’re towering over trying to get the shot which results in blurry shots. That’s why the image stabilization function of a camera is so important. Imagine having to set-up a tripod before every Instagram-worthy meal! You may be wondering what this ‘Bokeh’ is all about. 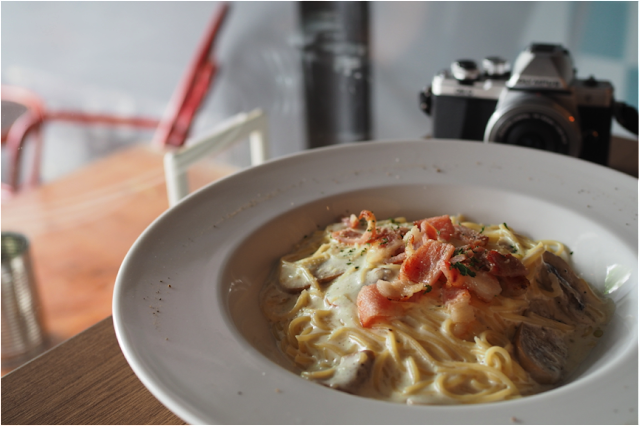 In essence, the bokeh effect always makes food look good. This is because the focus is on the food, and it defocuses on the background leaving it with a dreamy effect. 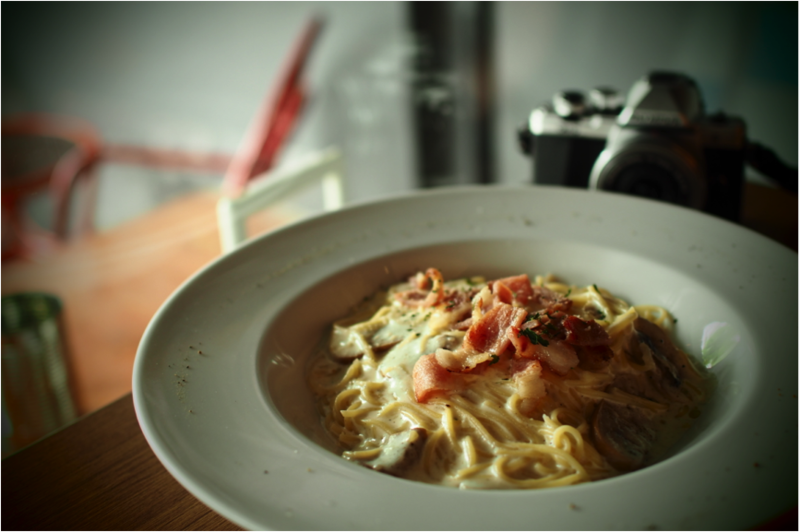 This requires a depth of field, so try to placing your plate at the edge of the table. Using the 25mm f1.8 lens and adjusting the aperture to 1.8 or 2, I tend to be able to get the perfect shot. The smaller the aperture, the shallower or dreamier the depth of field is. And if you have lights at the back, it just adds to the whole 'feel' of the photo. Forget about food on the table, the 'hipster' shot that has been making its rounds on Instagram often shows people holding their food. This, is pretty awkward because you probably will need a hand model. Most of the time i pick the friend with the smoothest hands, and maybe with an arm candy or two. With this shot, it’s all about your creativity in styling the shot – go wild and have fun! This usually involves someone casually eating, or when sauce is being poured onto something. Works great for stuff like pancakes (yes, maple syrup), waffles (yes, chocolate sauce), or you can also get a friend to use a fork and knife to cut through poached eggs and let the yolk flow. It's more of a candid shot, but as effortless as it looks, it's actually pretty tough to get the perfect shot. If your camera has the multiple shots function, it makes things a lot easier. The ART function is one of my favourite functions to use on the camera. It allows me to play around with dramatic effects, pinhole effects, sepia effects and a lot of other ones. This also means less editing on my part! All photos were taken with the Olympus OM-D E-M10 with a 25mm F1.8 lens. Cameras nowadays are packed with so many different functions that makes photography so much easier and enjoyable! In particular, food photography isn't as difficult as some people say it is - with the experience, you are bound to get the 'perfect shot' in minutes, or a couple of seconds. Now, who's up to take over my job? For information on the Olympus OM-D E-M10 and exciting promotions coming up in November do visit http://www.olympusimage.com.sg. Water Library Brasserie is all about classic French food in a posh and elegant surrounding. Sounds pretentious, but we promise you not. No dress code, no fuss and definitely not pretentious, all in the heart of Bangkok city. The place offers you a piece of the French lifestyle without blowing the budget. The entrance, adorned by an arch to resemble the Eiffel Tower, says it all. At Water Library Brasserie, it's about quality food while experiencing the true Parisan lifestyle. Also, as their name suggests, a wall full-on with an array of water selection greets you a few steps into the restaurant, which is divided into four section, including the back of the house, which promises you a view of Bangkok's skyline. From the menu, be sure to try the Cold Pasta as an appetiser. The dish features capellini, seaweed and lobster, tossed in truffle oil, making the dish extremely flavourful and aromatic. Good for sharing, and with generous chunks of lobster meat that adds on to the al dente texture of the capellini, this dish in our opinion, is a must-try. If you prefer salad, the Duck and Mango salad served with smoked duck breast is a good alternative to start your meal at Water Library Brasserie. From the seafood menu, be sure not to miss out on the highly raved about Chilean Seabass, served with bacon mushroom ragout and ponzu butter sauce. Rated as the most popular dish at Water Library Brasserie, this dish initially originated from Water Library Chamchuri, the fine dining wing of Water Library's group of restaurant. The flavour from the bacon added a good savoury touch to the dish without overpowering the freshness of the fish. From the meat section, the Duck Leg Confit with potato risotto and baby carrots fared pretty well on our tastebuds. The meat was fork tender, with a golden crispy skin on the outside. For dessert, be sure dive right for the Apple Tart Tartin, which takes 35 minutes to prep. Be sure to order beforehand, so that you don't wait too long. As soon as it is served, cut right into the piping hot buttery puff pastry filled with caramelised apples, and don't forget a bit of vanilla bean ice cream. To describe it in short - a party in your mouth. Water Library Brasserie is a place we highly recommend, and has definitely made it onto our favourite list of restaurants in Bangkok. The prices are slightly higher than most restaurants, but the quality ingredients that they use for their dishes will assure you that every bit you pay for it worth it. The word 'Panpuri' means wisdom. No, not a library, but an organic spa in this case. Everyone loves Bangkok for their massages, and i am no different. It is a must to head for at least one massage session each time i'm in town. Panpuri is located at Gaysorn, just right in the central shopping district of Bangkok, walking distance from the BTS station. The all-organic spa at the luxury mall boasts nothing but quality organic products for their treatments which include facials, massages and body treatments. Everything used is 100% made from organic ingredients, including the aroma oil that you get the choose from before your treatments. We had a go at the Mali Moonlight Soothing Massage and swore to come back to Panpuri the next time we are in Bangkok. Before consultation, the very professional staffs sit down with you to understand your needs and wants during the treatment. They also make it a point to ask your about your preferred area that you wish to work on more, so that they can customise the massage to your liking. Then you are led into a darken corridor, before entering a mystical looking room tiled with beautiful looking moroccan tiles, making you not want to leave the place, even after the treatment is over. The ambience at Panpuri's spa is one that's bound to sooth your senses and keep you relaxed throughout. They also have a store for you just beside the spa to pick up body oils and aromatherapy stuff which your may fancy. However, not all the products at the store are organic, so it's best to ask the sales associate if you prefer sticking to organic products. We spotted candles and body cream that smelt amazing, with floral and fruit abstracts such as lemongrass and mandarin orange. The service at Panpuri is not just great, it is excellent. Taking extra care to make sure you deserve nothing but the best, it is perfect for an afternoon away from shopping and for relaxing your soul. The treatments at Panpuri start from as low as THB 1300 for their foot massages, and THB 2100 for a 60 minutes body massage. With prices so affordable, and given it's positioning as a up-market spa, there's no reason that you should not pamper yourself the next time you are in Bangkok. What are the chances you'll stumble upon a good (if not fantastic) dim sum place in the heart of Bangkok? Ask me this question a few months back and my answer to you would be "probably never". Hong Bao, a Chinese restaurant helmed by acclaimed chefs from Hong Kong, will change your mind about Chinese food in Bangkok. They currently have 4 restaurants that boast long queues during the weekends, and they get extremely packed during dinner time, even on a weekday. For a start, we tried a few dim sum dishes. Like the usuals, the Superior Steamed Shrimp Dumplings had good bite, with semi-translucent skin wrapped around. The Steamed Rice Rolls with Cryspies Shrimp is a good rendition to the traditional rice rolls we usually get with fresh prawns or barbecued pork - the inner boasting a good crunch with shrimp, something that you can relate to a tempura. All eyes however, were on the Hong Bao Steamed Supreme Pork Dumpling with Abalone - a generously filled pork dumpling topped with a braised mini abalone. Extravagant you would think, but it comes with a reasonable price tag. Also to try would be their Barbecued Meat which comes in three different assortments. We enjoyed the caramelised char siew with the right notes of sweetness on the outside which was tender and juicy. The roasted pork however, stole the limelight with biscuit like skin that crackles on your first bite. You should also try your luck asking for some truffle mayonnaise on the side (which actually comes with the Fried Crispy Spring Rolls), because it was simply divine when we dipped the roast pork into it. A few other dishes we tried include the Sand Goby steamed with Soya Sauce, as well as the Stir-Fried Spicy Chilli Hong Kong Style Shrimps. The seafood for both dishes were extremely fresh, and if you can take a bit of spiciness, we suggest going for the shrimps. They also serve crab in that same style (Stir-Fried Spicy Chilli Hong Kong Style), in case you were wondering. The prices at Hong Bao are generally very reasonable if you compare it to reputable Chinese-Cantonese restaurants in Singapore. The quality of course, is also comparable, with the dim sum dishes highly raved about by the locals there. Will we be back the next time we visit Bangkok? Most definitely! Siam at Siam Design Hotel Bangkok is one hotel that i absolutely adore. Your first step into the hotel and you'll be greeted by wooden accents all over, under a warm lighting that showcases the raw detailing of the concrete walls, alongside art pieces scattered here and there. If you think design is all about fine and pretty details, this hotel will completely change your mindset. Besides being a stone throw away from the National Stadium BTS (or to be exact, a 3 to 4 minutes walk), the location is superb - street food just outside the hotel, a huge fast food outlet that opens till past midnight just next door, and a 24 hours convenience store just a minute away. Talk about convenience, the hotel has several food and beverage options for you to choose from - PH1, which serves authentic Thai buffet at noon and turns into a bar at night; Bar Eleven, a place to relax and unwind over drinks; La Vue, a restaurant on the 25th floor overlooking the skyline of Bangkok while indulging in French food; The Roof, a place to hang out over food and drinks while sitting under the stars. Oh, and a sushi bar as well on the first floor! The amenities are countless, with a gym situated on the 10th floor and a full-fledged spa - Spa Ten. The spa features a menu of luxurious massage and facial treatments that would cater to your needs - this includes a private room with a jacuzzi, a couple room, as well as a place specially created for Thai massage. Speaking about pampering yourself, this is the place to go! On the lobby floor, an infinity pool with a spectacular view of the city's skyline awaits you - a place that i wouldn't mind just staying at for a couple of hours day-dreaming. It also overlooks the National Stadium, so you might catch a glimpse of a sporting match! If you are a club guest, the club lounge, My Club, is open everyday serving complimentary refreshments all-day long, including tea time snacks which include traditional desserts and savouries. The rooms at Siam at Siam are separated into 4 categories. Starting from Leisure Class, which comfortably fits 2, to Youth Class which will fit a party of 3. There is also the the Biz Class and Grand Biz Class with bigger room size and better sceneries that overlook the National Stadium. Perhaps if you get lucky, you would be watching a soccer match from your room live. The decor of the rooms are pretty much similar but with different artistic angles and elements, accompanied by orange hues in play that compliment that strong wood accents and the raw concrete walls that give it an effortlessly chic designer look. The warm lights add on to the ambience and the most of the bathrooms come with an attached bathtub. We also enjoyed the fact that the minibar was well stocked with a variety of snacks and drinks. If your room comes with breakfast, you can expect to wake up to a scrumptious American breakfast buffet daily before starting your day. The spread at PH1 includes your usual bacon, eggs done many ways, as well as a full-on salad bar accompanied by a selection of fresh bread and juices. With location so central and with so much that they offer under one roof, it is no surprise that we would be back at Siam at Siam pretty soon. Did we also mention that service is excellent and their staff are mostly well-trained in English? This place definitely got a thumbs up from us!